I have a Mac Pro 2016 with the touch bar and when I hit the ESC key or the function keys on the touch bar the are not passed to my window 10 machine. Has any one else experience this issue? Please provide more details for your machines (OS version, 32/64 bit, Synergy version installed). 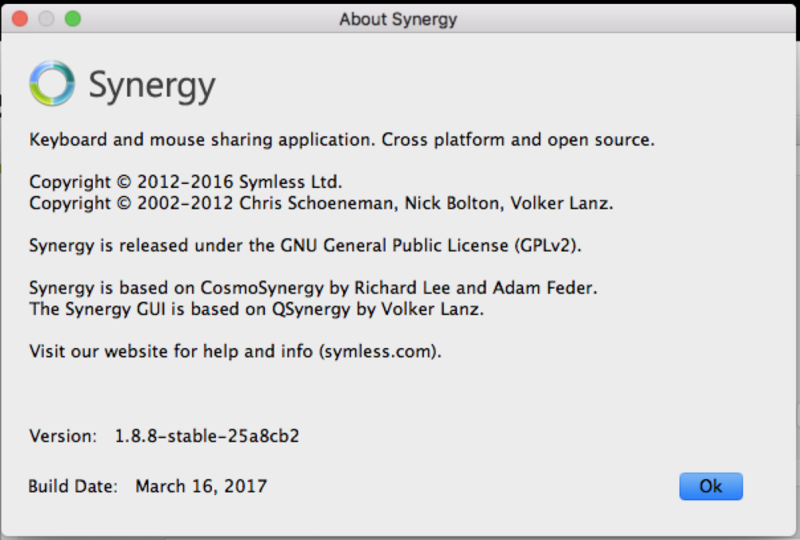 I believe its the 64bit version of synergy however the about doesn't seem to say ( I attached a screenshot). I will also note that every time the Mac goes to sleep and the network is connected my mouse stops responding. I was able to find more info yes its 64bit. @Lypian I just verified that we are not yet supporting Touchbar for Mac. Although, our developers are working on it for it to be supported soon. We can't provide an ETA yet when it would be available. Please bear with us as we try to make Synergy better for everyone. Sounds good. Figured as much I've had the Mac since Dec just wanted to check. Can I get and update?